after 4 days trapped below ground. The Belgian pot-holer who has been trapped in the underground cave systems of the Navarra Pyrenees since Saturday has been safely brought above ground. Anette Van Houtte was brought out by a specialist team of the Civil Guard early on Wednesday, with the team taking it in turns on carrying the stretcher along the almost five kilometre journey to the surface. 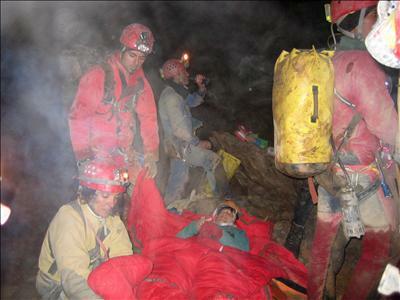 She was trapped at a depth of 650-700 metres in the Sima AN 51 Piedra de San Martín cave near the town of Isaba, suffering fractures to three toes and an open wound when she was caught in a rockfall. She is now being transferred to hospital in Pau, in France. Dominique le Senechal, the fire brigade commandant from Pau who was with the French team helping in the rescue operation, told El Mundo newspaper that the rescue concluded at 5.38 this morning. He described it as perfectly coordinated. Óscar Esteban, his colleague with the Spanish Civil Guard, said only one of the rescuers was slightly injured and was able to reach the surface on foot. There was some difficulty as the team neared the exit, where the passage was too narrow to get the stretcher through: the team was delayed some five hours while blasting took place to open up the route.